Space shuttle Columbia began mission STS-61C with a beautiful sunrise launch in January 1986 after several delays. Led by commander Hoot Gibson, the astronauts deployed a commercial communications satellite and tended to numerous experiments with the Materials Science Laboratory, Hitchhiker platform and Getaway Special Canisters in the payload bay. The crew included Congressman Bill Nelson of Florida, the first U.S. Representative to fly in space. Watch this post-flight film narrated by the astronauts. A long, slender stream of ancient stars has been discovered racing across the northern sky. The stream is about 30,000 light years distant from Earth and is flowing high over the Milky Way Galaxy at some 230 kilometers per second, or more than half a million miles per hour. The discovery was made by Canadian astronomer Dr. Carl Grillmair and his colleague Odysseas Dionatos from the Astronomical Observatory of Rome. Grillmair will present his findings today at the American Astronomical Society meeting in his hometown of Calgary. "What we can see of the stream is over 30,000 light years long, although it may actually be much longer than that since we are currently limited by the extent of the survey data. I would actually be somewhat surprised if the stream doesn't extend completely around the Galaxy," says Grillmair. The astronomers believe the stars on this cosmic "highway" date back nearly to the beginning of the Universe and are the fossil remains of a star cluster that, in its prime, contained between 10,000 and 100,000 stars. The ancient cluster was torn apart over billions of years by the tidal forces of our Milky Way Galaxy. "The discovery gives new weight to a theory that, while the Milky Way now contains only about 150 such giant star clusters, it may once have been swarming with thousands of them. If this idea is correct, there may be hundreds or even thousands of such stellar streams ringing our Galaxy," says Grillmair. On the sky, the stream is narrower than the pinky finger held at arm's length. Although it spans more than 130 times the diameter of the full moon, or roughly one-third of the northern sky, the individual stars in the stream are too faint to be seen with the unaided eye. The narrowness of the stream indicates that the original cluster was not torn apart violently, but rather that the stars were pulled out gently, perhaps a thousand or so each time the cluster passed near the center of our Galaxy. The orphaned stars continue to follow one another along their original orbit, long after their parent cluster has dissolved completely away. 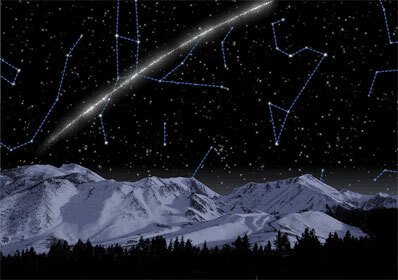 The stream was discovered using a public database known as the Sloan Digital Sky Survey, through a technique called matched filtering. Using the colors and brightness of stars like DNA markers, the scientists assigned to each star a probability that it could have a particular age and distance. By examining how these probabilities are distributed across the sky, Grillmair and Dionatos were able to push through the vast sea of foreground stars in the Milky Way and see the stream floating out among the dark and lonely reaches of the galactic halo. "The stream's path on the sky is very smooth. The lack of any substantial wobbling tells us that, at least within a distance of 30,000 light years, there are no large concentrations of invisible dark matter. The stream is a remarkable find and provides a new avenue of research into the makeup of our galaxy and how gravity behaves on large scales," says Grillmair. Six such streams have been found in recent years, three of them by Grillmair and his team, and all but one of them in the Sloan Digital Sky Survey. Studies of the streams discovered so far point to a massive halo of invisible dark matter surrounding our galaxy that is very close to spherical in shape. How far this halo extends, how it was formed, how lumpy it is, and what the dark matter is made of, are among the big questions that astronomers are currently trying to answer. Funding for the Sloan Digital Sky Survey has been provided by the Alfred P. Sloan Foundation, the Participating Institutions, the National Science Foundation, the U.S. Department of Energy, the National Aeronautics and Space Administration, the Japanese Monbukagakusho, the Max Planck Society, and the Higher Education Funding Council for England. Dr. Grillmair is an associate research scientist at the California Institute of Technology's Spitzer Science Center in Pasadena, California. He is the lead author of a paper on the stream's discovery which was published in the May issue of Astrophysical Journal.